Leading barrel sire A Smooth Guy will stand the 2018 season at Royal Vista Ranches in Wayne, Oklahoma. WAYNE, OK�SEPTEMBER 20, 2017�A Smooth Guy, the up and coming Myers Ranch sire, will stand the 2018 breeding season at Royal Vista Ranches in Wayne, Oklahoma. After standing his first several successful seasons at stud at the Myers Ranch in St. Onge, South Dakota, it was decided to move him to a larger breeding facility to better handle the number of mares he was receiving. "We are excited about the move and are confident that they will be better able to handle the volume of mares that Smoothie has been receiving the past several years," said Bill and Deb Myers of Myers Ranch. 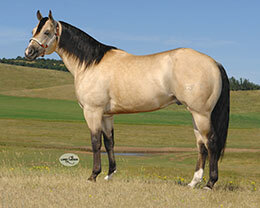 Sired by $11 million-dollar sire, Frenchmans Guy, and out of the producing Dry Doc/Jet Smooth mare, Docs Movida, A Smooth Guy has already made his mark in the barrel racing industry from his first couple crops of foals; siring top quality barrel horses such as Futurity Champion, Derby Champion and rodeo horse, Smooth N Famous (LTE $170k+) and barrel futurity money earners Colour Me Smooth, UX Smooth Talkin Doc, and A Smooth Bunny to name a few. A Smooth Guy will stand the 2018 season at $3,500. For breeding contracts and more information contact Laura at Royal Vista Ranches, LLC at 405.449.7575. They also have a Facebook page at �Royal Vista Ranches LLC� and an Instagram profile @royalvistaranches.